Cate and I trekked over to the HK Registration of Persons office this morning to apply for our Hong Kong ID cards, which are required for anyone staying more than 180 days. There’s no real analogue to this in the US, since there’s no mandatory national ID system in the States. The HKID is kind of like a green card, except that it can be issued for a specific duration; it’s not a “lawful permanent resident” card like the green card is. I should mention—hopefully without jinxing us—that in general our (granted, rather limited) experience with government bureaucracy here has been quite positive. 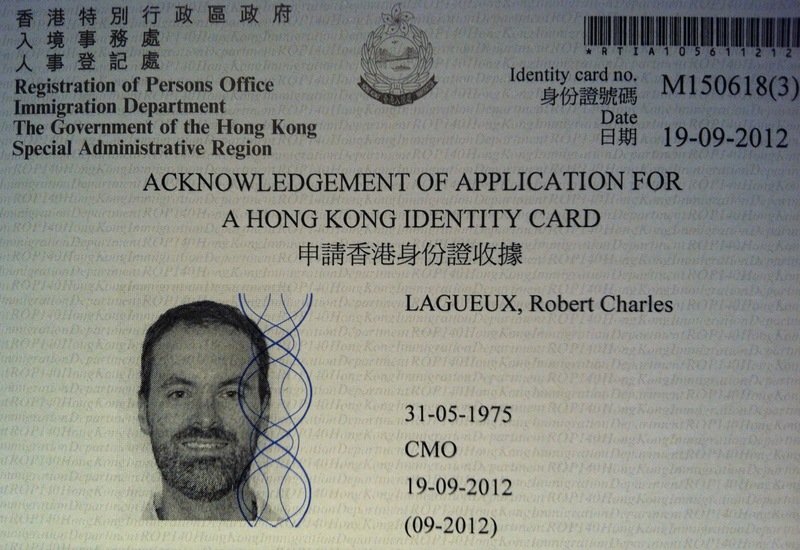 When we came through HK Immigration upon our arrival, the passport control officer stamped my passport with a tourist visa because I didn’t point out to him that I had an employment visa stuck in there. (In my defense, though, it was a long flight, and the thick sheet of glass between me and the immigration guy seemed to discourage dialogue.) Once I noticed the problem (fortunately, right after going through) and asked another immigration officer about it, he put me back in the front of the line to return to the window I’d come from, whereupon the guy apologized to me for the error. A few crazy stamps, a little bit of paperwork, and a five-minute wait, and everything was shipshape. Unbelievable. So it has been very refreshing to encounter what is, by and large, a very efficient bureaucracy with really quite pleasant and knowledgable civil servants. One also gets the impression that there is, shall we say, less of a commitment to Kafka-esque arbitrariness than the French demonstrate. (Fellow seekers-of-early-manuscripts in French libraries and holders of French cartes de séjour, please stand up.) To get our HK visas, I only had to fill out a pretty simple application form and return it to CityU with a photocopy of our passport pages (not the passports themselves). A few weeks later, they sent us the visas, which we stuck into our passports ourselves. Now that’s how to do it. You will love using the card at the airport as you leave and enter HK.